I love the wisdom of The Proverbs. Tonight in our Community Group, we are reading and discussing Proverbs chapter 4. My favorite verse in this chapter is 23: “Guard your heart above all else, for it determines the course of your life.” (NLT) It speaks of the priority of heart-health, and I don’t mean taking care of your ticker. The reason we need to guard our heart is, it gets hurt. It gets bruised. It gets crushed. Normal wear and tear on your spirit can wear you down and your heart can really ache. How do we get our hearts hurt? People disappoint us. We get lied to. Someone proves themselves disloyal. We fail. Sometimes, you just get tired. Life is full of disappointments and let-downs. You get passed over for the promotion. A relationship ends. Someone you love dies. These are the painful realities of life. No one can completely avoid it – hearts are fragile and they break. So it is vitally important for you to protect your heart. Don’t just offer it up for anyone to take pot shots at. Guard it. Guard it by watching the right stuff and reading healthy things and listening to stuff that will build you up. And maybe most important: be sure that you have someone who is looking out for your heart. Someone who loves you and will do anything to protect you. Guard your heart. Don’t try to be a hero and survive if your spirit is crushed – you are strong but you’re not that strong. 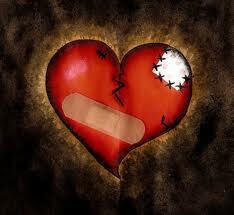 If your heart is broken and you allow it to go untreated, it will turn to stone. Self-preservation will take over and you will not allow others close enough to hurt you again. Once our hearts turn hard, the pain only intensifies. You were not created to live with a crushed heart. When (not if) your heart gets crushed, remember that God is close to those who have a broken heart (Psalms 34:18) and He wants to heal you (Isaiah 61:1, Luke 4:18). He wants to remove your heart of stone and replace it with a new tender heart (Ezekiel 11:19, 36:26). He wants to love you back into wholeness. Guard your heart…why? Proverbs tells us …”For it determines the course of life“. Your future well-being is on the line. And God has some wonderful plans for you! Be sure that you are ready for it! Guard your heart! Good and wise words Rick. Great post. I’ve always thought of this verse as pertaining mostly to romantic relationships, but I’d never considered extending it even to what kinds of entertainment and information we bring and allow into our lives.